Posted on January 20, 2017 by Matthew Leib. This entry was posted in Faculty Friday, Spotlight and tagged Faculty Friday. Bookmark the permalink. Anaid Yerena’s textbook is out of date. But the assistant professor at University of Washington Tacoma’s School of Urban Studies wouldn’t have it otherwise. Yerena teaches the course “Housing in America” and the text in question, Introduction to Housing, was last published in 2006. The out-of-print edition is intended to provide students a historiographical context for the period leading up to the 2008 housing crisis and is complemented by readings from an up-to-date course book on US housing policy. By introducing undergraduates to essential terminology and the basic tenets of US housing policy, Yerena’s course aims to inform students’ own notions of home ownership—empowering them with practical knowledge to be better advocates for themselves and others. She starts each quarter by asking students their reasons and motivations the last time they moved. Yerena’s own story began in Mexico. Born in Mexico City, she lived there for only a couple of years before the deadly 1985 earthquake prompted her family to relocate to Chihuahua. Just as she’d learned to read and write in Spanish, her family moved once again—this time to California, where her father joined a brother working in construction. She says her parents’ frequent moves were dictated by “where they thought they could have a better quality of life.” In raising Yerena and her younger brother, they made a living working an assortment of jobs: managing companies, owning a cafeteria, teaching high school. After just a few years in the US, her parents traveled to Great Britain as students enrolled in a community college exchange program—part of a joint effort to improve their English. There, children in tow, they were “required to log museum hours, go to the theatre, and attend concerts,” so naturally Yerena, then in second grade, would tag along. The experience provided her a broader context through which to view the world. “My cognitive map of the world was huge because I crossed borders so often,” she says. The next year, Yerena and her family moved back to Mexico, where they stayed for the rest of her childhood. Yerena studied architecture as an undergraduate and for her final project worked on a comprehensive plan for the city of Montemorelos, Mexico. Tasked with making projections and proposing solutions for the city’s development over the next few decades, she conducted a survey of every parcel of land at the city’s core. The work was, in so many ways, indicative of a carefree era of commercial development. Yerena, for her part, was looking for ways to develop professionally beyond her role, participating in every project management training and career development opportunity offered at the company where she worked. As she did, she began to muse on a master plan for her career. She determined the answer was an education, and—still living with her parents— began paying her own way through the master’s program in Urban and Regional Planning at UC Irvine. Then, after a year balancing work and school, the other shoe finally dropped—the housing market collapsed and her company with it. 250 of its employees around the country were let go—Yerena among them. Now jobless, living with her family, and without a viable source of income, she was faced with another decision: whether or not to continue her education. She decided to do so with the help of student loans. The decision to continue the degree gave her purpose, she says, and when the job market showed no signs of improving, she took the advice of a professor and embarked on a track for her Ph.D. But even with stability and certainty, she was still living on an income that placed her, along with many young academics, below the poverty line. After her parents moved back to Mexico once again in 2013, Yerena—now in her third year as a Ph.D. candidate—started living in campus housing. The experience in part mirrored her research into the role community advocates play in creating more affordable housing policy. For her thesis, she used quantitative analysis to conduct a survey of 272 cities with populations greater than 100,000 people aimed at understanding the efficacy of advocacy groups on the national level. She concluded that, at the city level, where community advocates were present, there was a statistically significant increase in affordable housing spending per capita. However, on a broader scale, advocates’ efficacy was muted when there was a lack of any cohesive regional approach. 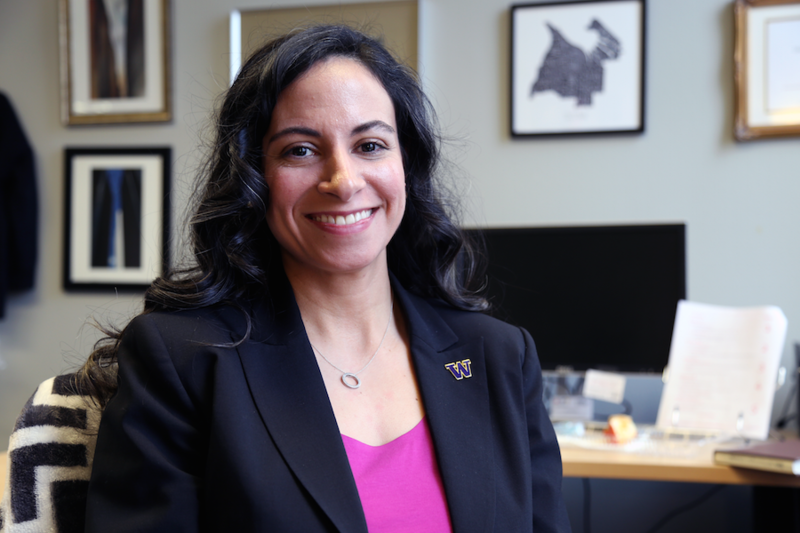 When time came to pursue an assistant professorship, she was drawn to UW Tacoma for just such a sense of regional connectivity and dynamism. “I felt it was a healthy region—one with potential for growth and one where this profession was going to leave me well-positioned to enter the community,” she says. However habitable Tacoma is in the short term, she still harbors some concern for its development in years ahead. It’s a trend that’s led her to probe an area many housing scholars let alone: homelessness. With more than 4,000 homeless people in the city, Seattle recently announced it would issue $29 million in bonds to pay for public housing to produce and preserve over 500 affordable homes. Yerena’s research argues that if cities want to stem homelessness and create affordable neighborhoods, they are best off working from the ground up. For her part, she’s starting with her students and currently preparing to teach a master’s course on movements and organizing that will work in connection with a homeless services provider in the community. Students will be able to get first-hand experience creating process evaluations that will one day help them run their own advocacy organizations or work as community planners who provide analysis to such groups. She contends sitting next to a service provider who is a caseworker at a homeless shelter informs students’ perceptions of the issue of homelessness in ways simply reading media coverage cannot and hopes to publish on the effects of this type of experience on students’ development as advocates in their own right. She argues adequate housing allows communities to thrive, enabling residents to become a stronger economic force in regions on the whole. For someone who has known many homes, Yerena is now hoping to help make Tacoma and the surrounding corridor a more permanent one for all residents—herself included. Anaid Yerena holds a B.Arch. from the Universidad de Monterrey and an M.U.R.P. and Ph.D. from University of California, Irvine. She also teaches Introduction to Urban Planning, Statistics for Urban Analysis, and Research Design.